Villa Hurriyet bedroom luxury private villa overlooking Kalkan and Kalamar Bays. This property offers breath-taking views out towards mouse and snake islands and its own infinity pool. Villa Hurriyet bedroom luxury private villa overlooking Kalkan and Kalamar Bays. This property offers breath-taking views out towards mouse and snake islands and its own infinity pool. 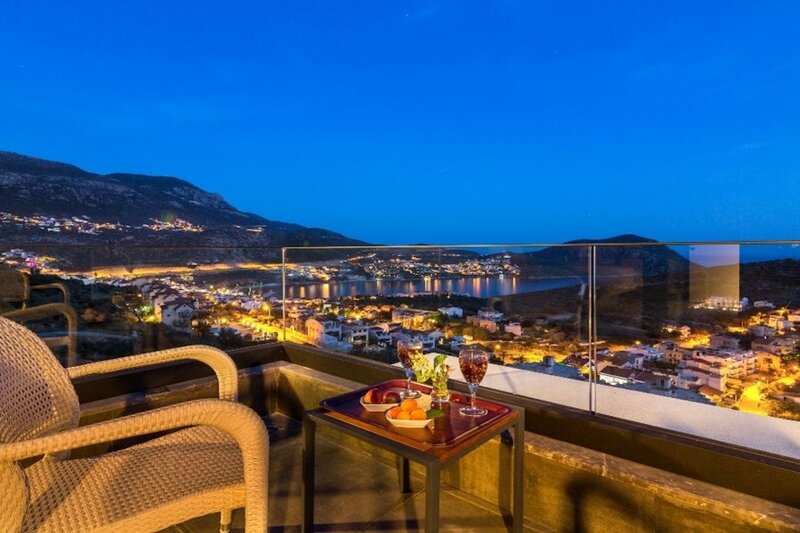 The centre of Kalkan is a 15/20 minute walk away, where there is a selection of excellent restaurants. Recently completed to a very high standard, the villa has truly breath-taking views out towards mouse and snake islands and its own distinctively-designed swimming pool complete with Jacuzzi section and childrens pool. The main feature of this villa is its magnificent pool - this features a Jacuzzi section, together with a childrens pool, an area into which sun loungers can be placed as well a large swimming area (4 metres x 12 metres). The pool terrace is spacious and furnished with dining table, eight sun-loungers and a comfortable shaded seating area from which to enjoy those stunning views. Fully fitted kitchen is situated off the lounge area and its large and well equipped. Set to do side of the lounge is a raised dining area with a large table and comfortable dining chairs. The kitchen is modern and good design, there are everything what you need during your stay. The lounge has a high quality marble floor throughout is the spacious, light and airy lounge with comfortable sofas and armchairs seating. There is a satellite TV with a DVD player as well. The lounge designed for your comfortable and relaxing. There is unlimited internet access for you. The living room direct access to pool terrace. This five bedroom villa has three double bedrooms, one twin bedroom and one master-bedroom. All bedrooms are ensuite.